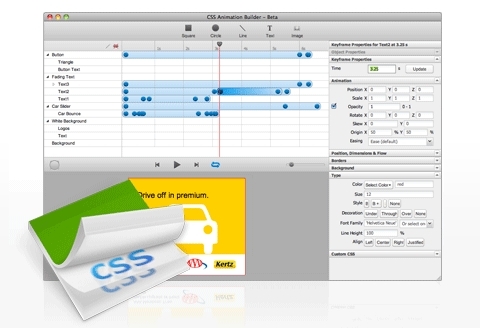 Sencha Animator is a powerful desktop application to create awesome CSS3 animations for WebKit browsers and touchscreen mobile devices. Make your static content come to life quickly and easily, without the dependency of third-party plugins or writing a single line of CSS code. In no time at all, you’ll be creating rich experiences for today’s most popular devices. You can animate text and images with smooth transitions, design buttons with gradients, and embed analytics tracking code. All with the power of web standards. Sencha Animator is an easy-to-use desktop application with an intuitive graphical user interface (GUI), including an interactive timeline and object property controls. Similar to timeline concepts in other applications, Sencha Animator gives you the power to manage sequencing, grouping, easing, and other motion effects. Adjust an object’s properties and instantly play the animation in the stage area. There isn’t an online demo? If it’s so powerful why do I have to download it? The demos for this look really cool. Once Fire fox 4 comes out I am going to download this. Thanks for the heads up.